I’ve just gotten into an accident! What do I do? You can have your vehicle repaired anywhere you wish. if you’d like our help when choosing a repair shop, consider giving us a call for a suggested repair facility. You’ll get convenient and guaranteed repairs. Every insurance company handles the claims process a little differently. It’s important to understand your options before making any decision about where and how to get your car repaired. We can plan with you to have your vehicle moved directly to an authorized repair facility. These options are all designed to expedite the process and make an unfortunate event less stressful. What should I do if my vehicle has just broken down? NOTE YOUR VEHICLE’S LOCATION. Make sure you are aware of your surroundings. Notice landmarks such as gas stations, restaurants, mile markers or last exit seen. Assess your vehicle’s operating problem. Be aware and know how to respond to warning signs such as steering problems, smoke, or unusual noises. 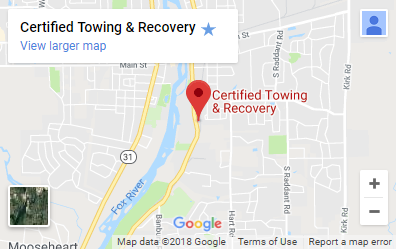 Call Certified Towing & Recovery immediately. We will need your full name, phone number, vehicle make, model and key location. Need a repair facility? Our dispatchers will be ready to provide you with a recommended repair facility in your area that will provide you with the best service possible at a fair price. What should I do if I just suffered a personal injury in an accident? Being involved in a personal injury car accident can be scary, but it’s important to keep calm. Your first steps following a personal injury accident can affect the reimbursement that you get from your car insurance company if you file a claim. Seek medical attention. See a doctor immediately. Although you may feel fine now or think your injuries aren’t very serious, symptoms can appear days after the accident. Getting medical attention quickly isn’t just the best thing to do for your health; it also strengthens your personal injury claim. Take detailed notes and photos. Jot down the names and addresses of all witnesses and any medical offices you may visit. Keep records of all medical bills and receipts. A journal or daily diary about your injuries and medical care is suggested. Acquire injury attorney representation. If you have a complex question and need a little help? Ask an expert. Most Injury Attorneys will evaluate your case at no charge.